"Don't let them get to you," say my haphazard dreams, filled with martial arts and semi-precious gifts. "Don't let them bring you down." Then I came to, the moment breaking into consciousness. I walked back to my house, all speculation absent from my mind. Once again I listened to the lonely noise of scratching gravel accompanied by the creaking of a rusty gate. Please feel free to join and let's get the awesome, active veggie community in Vancouver talking again! dont you darlings know what its made off. Worse is like jello ! Add Me Veg - Active Community! 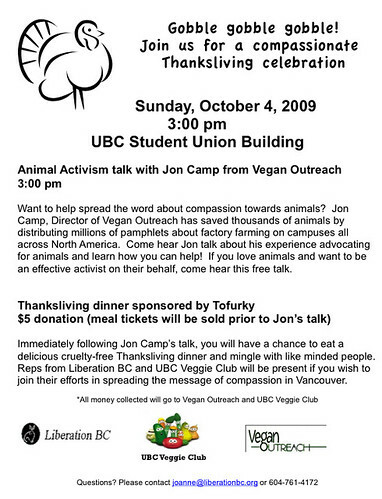 Add Me Veg - an 'Add Me' community aimed at vegetarian and vegan friends on livejournal! Promises to be a drama free, non-snarky, fun space! Looking forward to seeing you over there!! New Vegan Restaurant in March! Last night my little family was walking on Broadway near Cambie (we'd just had dinner at Sha Lin Noodle House - have you been there? they do some nice vegan foods, and even make sure to ask if you want veggie broth or chicken broth when you order soup - and my kid loves watching them hand make the noodles and dumplings), when we saw, just a few doors away from Sha Lin, a new VEGAN restaurant is opening!!! I guess they're opening in March - I stuck my head in and they didn't mind stopping and talking to us for a minute - apparently they will be all vegan, and not only have a few asian-style dishes (their words), but also have stuff like "fish" and chips, and hamburgers, and pizza, and they'll be using daiya cheese. It was Lovin'... something, anyway. I apologize for my bad memory. Anyway, heads up, folks, there's a new restaurant a coming! 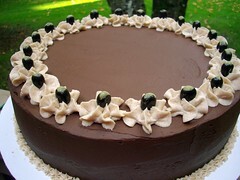 VeganMania Launches A Treat of the Week Delivery Service! Starting in February, VeganMania will be making weekly home (or office) deliveries of vegan sweets & treats all around the GVRD. Everything we make is 100% free of dairy, eggs, & honey and we use local, sustainable and organic ingredients wherever possible. There's no better way to indulge yourself in deliciousness, and these subscriptions make great gifts. As a bonus for all our new subscribers, we're offering a chance to win a 2nd month of deliveries FREE for everyone who signs up for February! VeganMania @ the Big Holiday Market This Saturday Dec 12th! Organic, Vegan Holiday-themed Goodies only available once a year! They make great gifts, stocking stuffers or holiday party snacks! Did you know there's going to be a really awesome fundraiser for Hearts on Noses Pig Sanctuary next weekend? That's right! 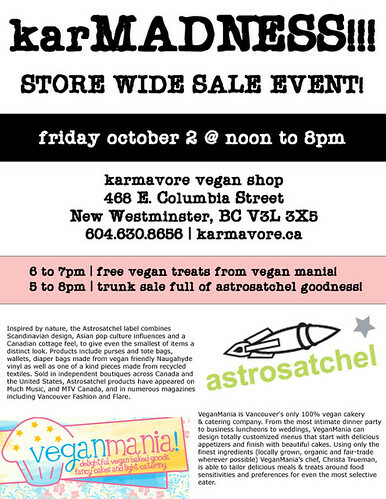 It's being held in the super cool all-vegan shoppe Karmavore in New Westminster. When you buy your ticket, not only will you be helping out a fantastic organization, you'll get to meet Sarah Kramer (author of several popular vegan cookbooks), eat delicious vegan food, and you'll bring home a fabulous, swanky, wonderful, flashy 2010 Go Vegan! Calendar, autographed by Ms. Kramer herself! Be the envy of all your friends! The Hearts on Noses sanctuary is run on a tight shoe string budget and depends entirely on donations to help take in and care for abandoned pot-bellied pigs. It's especially in need right now as they've had to move their facility this month, which has been expensive and time-consuming. Pot-bellied pigs are very sweet, clever creatures and often adopted by people who have NO IDEA what they are getting themselves into until it's too late. Unfortunately it's the pigs that suffer in these circumstances. Hearts on Noses strives to educate the public about all that's involved in raising pot-bellied pigs, and to provide abandoned/surrendered pigs the chance to have a comfortable, safe and healthy life. Go to this page to check out all the details and buy your tickets! You don't wanna miss this! I am wondering if anyone is (or knows of!) any Christian vegans in this city? I am transitioning to veganism and am looking for fellowship in meeting with others who use their faith belief as a driving force in their veganism. Sorry if this is out of place, but I'm not sure where else to turn! I dont' know many other Christians, let alone many other vegans. Vegan stuff to do around town. VeganMania is representin' at both these events next weekend. You should check 'em out. Has anyone been to Karmavore? Has anyone physically gone to Karmavore? I hear they have vegan marshmallows and things!! Bucking trends and avoiding conformity is nothing new for Magdiale Wolmark, co-owner and head chef of Dragonfly Neo-V. Far from what one thinks of as a typical chef or artist, the idea that he’s creating his own way, and a new path for his business and his craft, suits him just fine. Read our Exclusive In-depth interview on LifeEpicurean.com's Editorial Director Chris Spinato, and be sure to check out Chef Wolmark's Shiitake Pine Nut Tartare recipe, exclusively for LifeEpicurean.com! READ MORE HERE. i need to secure a line on some powdered soy milk or powdered rice milk. this is not the same thing as soy flour or rice flour. any ideas? i live in surrey and i've checked all the likely spots here and in new west and burnaby but was hoping some of you lovelies would have a solid source you could recommend to me to save me some time/energy calling or running around. thanks in advance for any tips you can give me in my quest! Well versed in family-friendly comfort foods & re-creating all the non-vegan meals you love! I’ve been cooking vegan delights for my own family for over ten years and understand that while we love being vegan, not everyone wants wheat grass stir-fry or quinoa crouquettes. My experience and knowledge translates into delicious, compassionate cuisine for you! If you'd like to discuss anything written about here, with no obligation, just send an email to bakery@veganmania.com, for some sample menus and price quotes. I look forward to working with you! Oh, and while I'm here, I should mention that VeganMania is back for another fantastic summer season at the farmers markets starting in July. Come on out for all your old favourites and some new additions. And join the Facebook Group or follow VeganMania on Twitter. i saw this posted on the main vancouver community & went over and checked it out. they still have a ton of quinoa flour, and noone has touched the soy beans in the dry bins. just thought you might want to know. Just a heads up - there is a new vegetarian restaurant on Cambie street, called G3, beside the Park Theatre (between 18th & 19th). I stopped in for some take-out today, and it's nice - the decor is lovely, the food is interesting (in a good way), and the staff is very friendly. I guess it's Asian fusion? Some of the menu items look really intriguing, I can't wait to try it again. I am spreading the word, hopefully it doesn't go the way of the OM! Prices are not bad, around the same as Bo Kong, I guess, some dishes a bit less. Anyway, check it out if you can. Dine Out 2009 for Veg-Heads? Wondering if any vegetablamarians have any experience with Dine Out this year? If yes, recommendations would be greatly appreciated. Vegan options a TOTAL plus. does anyone know where i can find white rice chocolate? 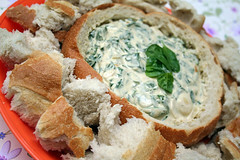 VeganMania Kitchen @ the winter markets & on Facebook! We'll have our usual line-up of goodies, including some delicious gluten free treats and agave-sweetened yummies. Also, you should check out our holiday goodies that are only available thru December every year - including our popular chocolate-dipped vegan shortbread, gingerbread, almond cranberry bark, & chocolate pecan pies - by visiting us at our holiday market at Heritage Hall on Main Street, Saturday December 13th, from 9am to 5pm. Pre-orders are encouraged to prevent disappointment! And finally, if you're on Facebook you should definitely visit our page there; add us to your pages to keep abreast of all the latest VeganMania happenings, which will soon include underground restaurant nights and other fun stuff! So, I was down in Portland a couple of weeks ago and stopped in at Food Fight Vegan Grocery Store (man, were they ever surly in there that day!) and found, in their freezer section, the most convincing looking rashers of vegan "bacon" ever. Long thick pink strips marbled with white streaks of "fat". I was never a huge bacon-lover even when I ate meat but the prospect was just so...IDK, fascinating and hilarious...that I had to buy it. So I did, and just this weekend we got around to trying it out. We fried it up in a little olive oil and, uh, WOW, is all I can say. Just, WOW. It was disturbingly convincing. We had it alongside tofu scramble with toast and my kids (who have never tasted meat) were like, "Ok, we can sort of understand why people would want to eat bacon if they didn't care about animals at all." ANYWAY, the whole point of the story was to ask if anyone has seen this stuff for sale around town? Because unfortunately, it gave me a hankering for a BLT. Yeah, yeah, I've made them with the Yves "Canadian Bacon" slices in the past but truly, that stuff just pales in comparison to whatever the Taiwanese are doing with their soy products. Oh, did I not mention that? Yeah, it was imported from Taiwan. I stupidly did not save the label, but after some internet sleuthing I found this, which I am pretty sure is the same stuff. There's the shop next to Bo Kong on Main Street, right? And there used to be one in Crystal Mall in Burnaby. And then there's another in Richmond that is part of an organic vegetarian sushi restaurant, and I'm thinking they're my best bets...but I am located in Surrey and would rather not trek all the way out to those places without having the presence of this veggie bacon confirmed. I do have a T&T market near me but I checked out the veg' freezer section this afternoon and it was a bust. Thanks for any help you can give me on tracking this stuff down. If you haven't tried it yourself, I would recommend staying away, unless you want to develop a serious dependancy!